“The scar didn’t use to show,” says Daniel, the narrator of the title story. 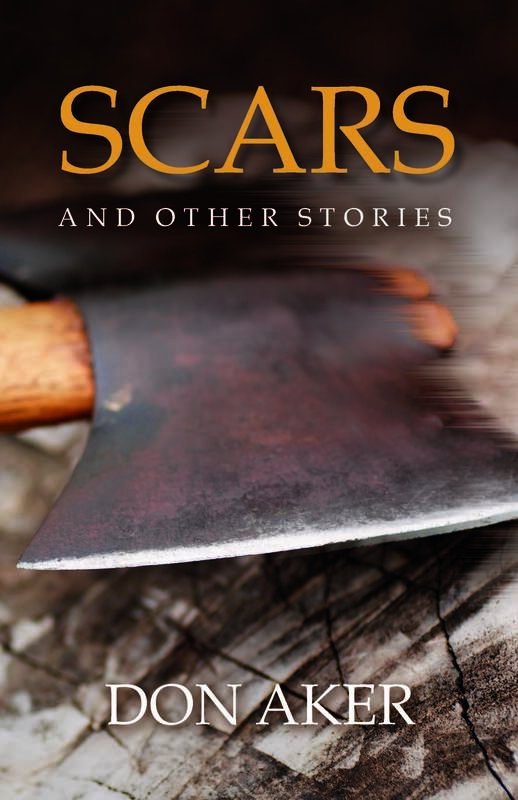 But scars have a way of manifesting themselves, visually or otherwise, and the stories in this collection illustrate a varied assemblage of characters indelibly marked in some way by their experiences. Having lost a breast to cancer, a young woman visits a psychic seeking answers to the questions in her life. A bullied boy finds solace in the arrival of another unfortunate who has attracted the attention of his tormentors. A divorced father attempts to shield his young daughter from the trauma of tragedy. An eight-year-old boy witnesses death for the first time, a massage therapist is unnerved by the discovery he makes about a new client, and a young widow flounders in her struggle to cope with the loss of her husband. These and other characters come to vivid life in stories told with the sensitivity and skill that have earned the author continued critical praise. QUESTION: You’ve been writing for nearly thirty years and you’ve firmly established yourself as a young adult author. What made you decide to write a book aimed at an adult audience? DON: I actually began my career writing short fiction for adult readers, and the short story form has always been my favourite genre to work in, so it seemed natural that I would return to it at some point. Last year, I was approached by a Nova Scotian publisher, Lesley Choyce at Pottersfield Press, who told me he was expanding his catalogue and asked if I had something other than YA fiction I might share with him. I sent him several short stories I’d written over the years, some that had been published previously and some that were still drafts, and this collection is the result of our collaboration. QUESTION: How many of these stories have appeared in print before? DON: There are twenty stories in the collection, and ten of them had been published elsewhere. QUESTION: Do any of them have special significance for you? DON: They’re all significant for one reason or another, but a couple of them stand out. One is “The Invitation”, which is the very first fictional narrative I wrote as an adult. It won first prize in the 1989 Atlantic Writing Competition, was selected by McClelland & Stewart as one of the thirteen best short stories published in Canada in 1990, was nominated for the Journey Prize Award, and earned me a $10,000 Cross-Over Writer's Grant from Telefilm Canada. "The Invitation" actually launched my career. QUESTION: What’s the story about? DON: The narrator recalls an incident from his childhood, reliving where he was and what he was doing when President John F. Kennedy was assassinated. QUESTION: You mentioned two stories that stand out for you. What’s the other one? DON: The title story, “Scars”. It’s about a fifteen-year-old boy whose father accidentally strikes him in the head with an axe. It’s probably the most autobiographical of all the stories I’ve written. QUESTION: So your father struck you with an axe? DON: Yes, and it was entirely my fault. He was chopping up a van and I was standing exactly where he told me not to. Behind him. QUESTION: Chopping up a van? Seriously? DON: My parents didn’t have a lot of money when I was growing up, so in order to keep his own vehicle running, my father sometimes bought a much older vehicle for next to nothing and then cannibalized it, taking parts off it and putting them on his own. When he’d gotten everything off it that he could use, he’d chop it up with an axe and we’d load it onto the back of his truck and take it to the dump. QUESTION: And that’s the scenario that plays out in this story? DON: Yes. I’ve fictionalized it, of course, but many of its elements strongly reflect my own experience. QUESTION: Are there other stories in the collection that reflect your personal experience? DON: All of them, in one way or another. What compels me to write a story in the first place is something I’ve seen or heard or done that resonates with me so strongly that I can’t help writing about it. QUESTION: What happened that led you to write “Everything Gets Dead”? DON: My wife and I had taken our younger daughter for a walk in a recreational area much like the one in the story, and a startled deer leaped a fence surrounding a baseball diamond and was injured in the same way. All I could think about at the time was getting our daughter out of there before the deer was put down, which later got me thinking about how children are often impacted dramatically by the actions of adults. QUESTION: Although Scars and Other Stories is aimed at an adult audience, at least half of the stories in this collection have a young person at their center. Why is that? DON: Every adult on this planet has been influenced in very real ways by events he/she experienced while growing up, and I’m particularly interested in exploring the kinds of experiences that help shape the adults that children eventually become. QUESTION: There’s a story in the collection called “Cameron Lake, 1964” and, below its title, you’ve written “with thanks to Dave Eggers”. Why? DON: I’m embarrassed to admit that, as a teacher, I routinely told my students that the second-person point of view (“you”) was not a valid one from which to tell a story. That viewpoint always reminded me of those tiresome “choose your own adventure” stories that were popular at one time, so I always encouraged my students to use the traditional first- and third-person points of view. That, however, was before I read “Accident”, written by Dave Eggers. (At the time of this interview, "Accident" could be found online at https://www.theguardian.com/books/2005/apr/16/shortshortstories.fiction) After reading that remarkable short story, I found myself itching to use second-person narration to tell a story about, as Eggers refers to it, “a moment of clarity”. QUESTION: Did you, as a child, experience anything like what happens in that story? DON: Yes. As a young boy, I went with my parents to a company picnic, a family event sponsored by my father's employer and held at a lake, and a person drowned in much the same way as the character in that story. It was the first time I’d seen someone die. I’m not sure I fully understood it at the time, but that memory has stayed with me all these years. QUESTION: The blurb on the back of your book suggests that all of the stories in this collection focus on characters who are scarred in some way, which explains the rather heavy subject matter in so many of them. “Playing Pool”, on the other hand, is funny. How do you explain including it with the others? DON: To my mind, a scar is merely something that remains with us, a reminder of a past experience, but not all scars are necessarily reflective of something tortuous. For example, I still recall vividly embarrassing moments that happened decades ago, minor humiliations that gave the people around me a great laugh. Although I'll probably always cringe when remembering them, I can still appreciate the humour they involved, the good-natured laughter they evoked. QUESTION: The steps that your character, Riley, follows to install his pool are remarkably realistic, almost a how-to for would-be DIY pool installers. You must have spent considerable time researching that process. DON: Yes, but not with the purpose of writing a story about it. While I’ve exaggerated some details, “Playing Pool” is, in fact, a fairly faithful account of my own experience installing an above-ground pool for my daughters in our back yard. Murphy’s Law was clearly in evidence throughout the ordeal—what could go wrong did go wrong—and I didn’t save a cent by installing the thing myself. Afterwards, as I thought back over all that had happened, I had to laugh, which got me thinking that there might be a story in there similar to those of the Vinyl Café. I’m certainly nowhere near the humorist that Stuart McLean was, but it was fun to stretch myself and go in a different direction. QUESTION: Earlier, you mentioned that short fiction is your favourite genre to write. What draws you to this form? DON: I like the challenge of compacting a narrative. When I’m working on a novel, I tend to overwrite, layering in details and backstories that I later have to pare down. For example, my novel Delusion Road was much longer in its original form, but my editor strongly suggested that I cut 40,000 words, which I pretty much managed to do (and vastly improved it as a result). Writing a short story requires much greater discipline, forcing me to narrow my focus and strip away all but the essential elements of the narrative, and I like having to alter my process to work within those limitations. QUESTION: Are there any short story writers that you especially admire? DON: Several, but my favourite is Raymond Carver. He was one of the most economical writers I've ever encountered. He could say in five words what others take fifty to convey. QUESTION: Do you plan to write more books for adults? DON: To be honest, I never plan to write anything in particular. I simply write what moves me to put words on my screen. If the result ends up being more suitable for adults, then I guess I’ll have written another book for that audience.